The past couple of weeks have been filled with exciting new projects and surprises, although one surprise was rather unpleasant. It involved our Churro bear having surgery. I'm glad to report that he is doing very well, so well that he's been outside chasing bees (bees!). One thing is for sure, summer already seems like it's passing by too quickly. Time to grab hold before it's all gone! 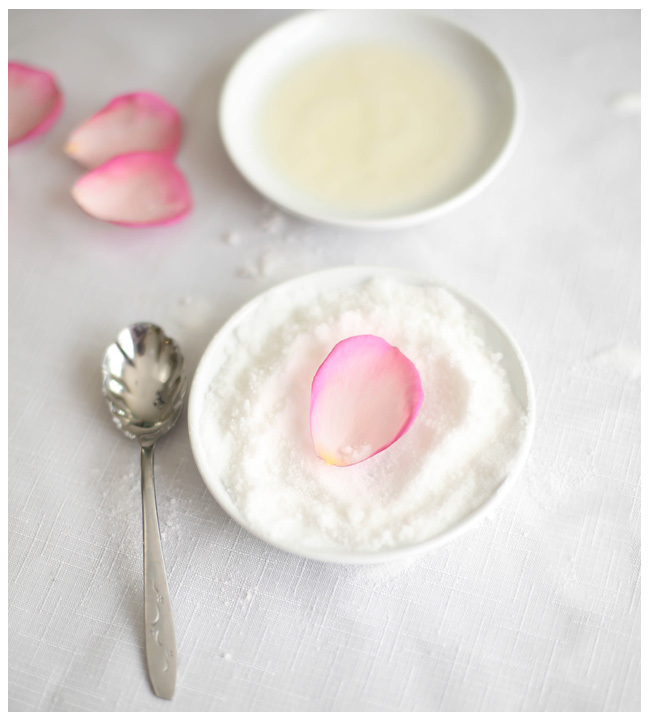 I think one of the best ways to do that is to crystallize rose petals, because you can find the most vivid and fragrant organic rose petals during summer months. I'd like to say there's nothing fancy going on with this tart, but who am I kidding? 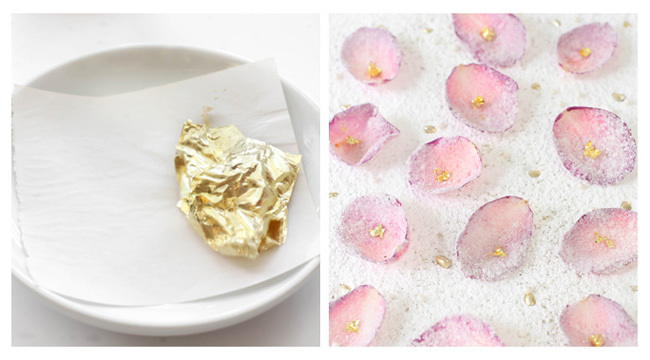 Candied rose petals and edible gold leaf is pretty fancy. But there's simplicity too. Strawberry jam is layered onto buttery tart crust and then everything is covered in rose-scented white chocolate ganache. Going the extra mile with petals and gold leaf just makes it even more dreamy. Fresh egg white is traditionally used as the "glue" that holds sugar onto the petals, but I like to use meringue powder mixed with water. Besides being safer than fresh egg white, it's lightly scented with vanilla! It hardens just as well as regular egg whites and, in my opinion, it's more delicious. I try to use the crystallized petals within a couple of days after drying because they darken over time, but that's just personal preference. They will keep for up to 10 days if stored in an air-tight container, and they are still very pretty after they darken. The small amount of rose water used in the white chocolate ganache is a nice compliment to the strawberry preserves in this tart. It tastes more fruity than floral and does a little dance on your tongue that says "flowers belong in dessert!". If you are new to using edible gold leaf, you'll find that it's very delicate and just exhaling normally will cause a sheet to fly across the room like a feather! I like to hold one corner down with the tissue included in the packaging and tear pieces away with a pair of dedicated decorating tweezers. If you're looking to buy, I found edible gold leaf here . Lightly grease a 12-inch rectangular tart pan with baking spray or clear vegetable shortening. Pulse the flour, sugar and salt in a food processor until combined. Add the butter and pulse until the mixture resembles coarse meal with some small pea-size butter lumps. Add the egg yolk, vanilla and water and pulse until just incorporated and the dough begins to form clumps. Turn out the dough onto a lightly floured surface and knead together slightly. Gather the dough together and form into a ball. Flatten into a rectangle. Press the dough over the bottom and up the sides of the pan in an even layer with well-floured fingers. Chill the shell for 45 minutes. Preheat the oven to 375F. Lightly prick the bottom of the shell with the tines of a fork and bake until the sides are set and the edge is golden, about 20 minutes. Cool completely in the pan on a wire rack. When the tart shell is cool, spread the 1 cup strawberry preserves over the crust. Combine the white chocolate and heavy cream in a medium saucepan and place over medium-low heat. Whisk slowly until the chocolate is melted and incorporated into the heavy cream. Gently whisk in the rose water. Allow the ganache to cool until just warm and still pourable. Gently pour the ganache over the strawberry preserves. Place the tart in the refrigerator until the ganache is set. 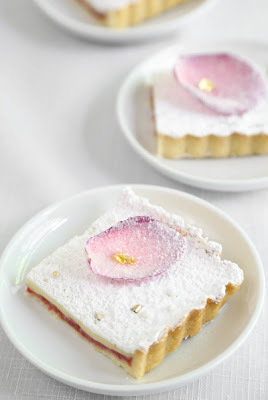 When the ganache is firm, sift the confectioners' sugar over the tart and decorate with candied rose petals and edible gold leaf. Mix together the meringue powder and water in a small condiment cup. Pour the extra fine sugar in a separate small bowl. 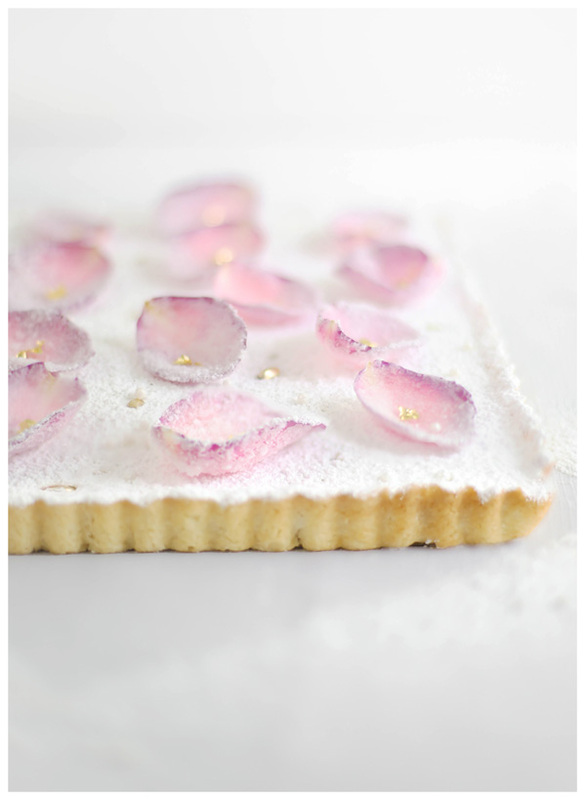 Dip the paint brush into the diluted meringue and brush a light, even coat onto the front and back of a rose petal. 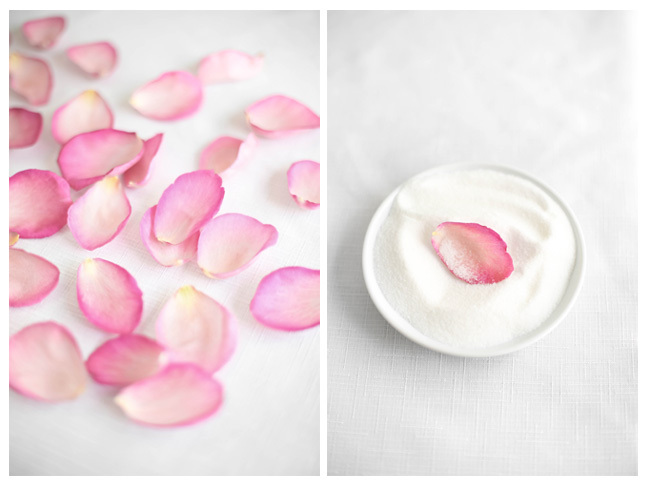 Dip the petal in the granulated sugar and place on wire rack. You can also place the petals upright in a clean egg crate to give them dimension. Repeat process with remaining petals until all are coated. Let dry at room temperature until crisp. This will take several hours, and overnight is preferred. Use for a decorative garnish or store in an air-tight container until ready for use. Sooooo pretty! I'm finding as I keep evolving my style I keep coming back to edible flowers, something I tried to curb my love for in the past. I think people are embracing them more readily now. Must get the cooking with flowers book! so elegant - absolutely lovely. Wow this is so unbelievably gorgeous!! Gorgous photos as always! I love adding a hint of rose to summer and spring treats. I shared a recipe for water madelines a couple months ago. Can't wait to try this tart! This is so unique!! Love this! Exquisite! This tart must taste just divine. Good to know that your Churro Bear is doing well. Aww so good to hear your dog is doing well. best wishes for his recovery. 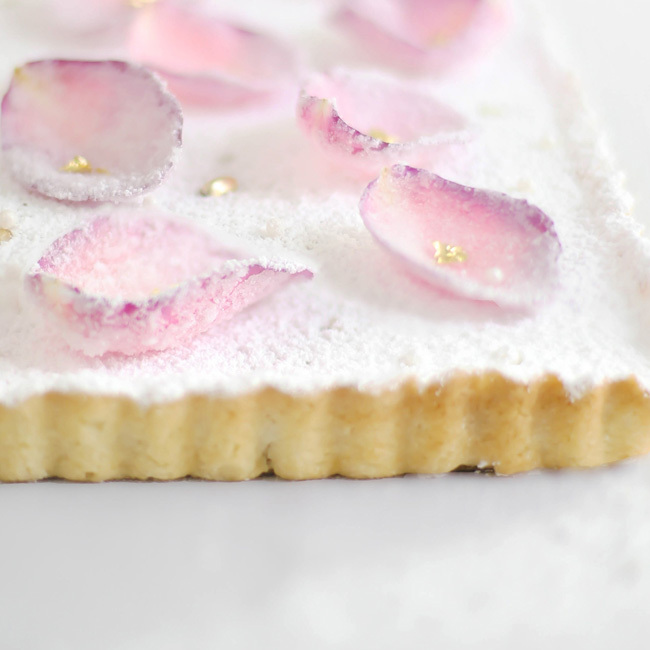 This tart is almost too pretty to eat! Un postre de auténtico lujo,muy fino y delicado, como la forma de presentarlo. My goodness. I feel like I should be drinking fancy tea in London while eating this tart. It looks so elegant. What a beautiful tart! I'd think I'd have to sit and looks at it for a good 20 minutes before digging in. So so pretty! In fact, way too pretty to devour!! I love rose water and the combo with strawberry here. Yum! I hope churro is doing ok! This looks beautiful in other news. Hi Heather, I have been following for awhile but this is the first time I have commented. 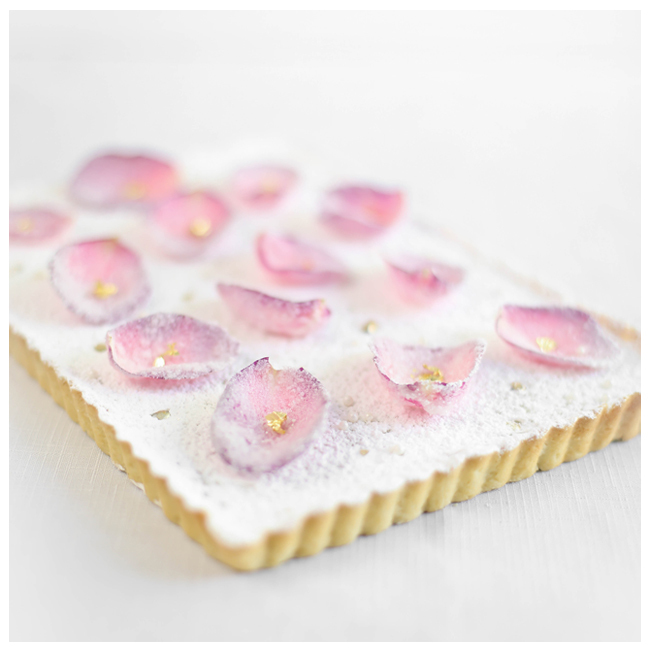 This tart is so elegant, simply beautiful and your photography just highlights how stunning it looks. Thanks for sharing! This is so beautiful. I think it should be featured at every Bridal Shower. this is exceptionally beautiful - so unique and dreamlike! Is this the same crust used for the chocolate caramel sea salt tart, so I can just adjust it for a 12 inch crust? This is stunning and sounds so good! This is stunning!! And I'm sure it's absolutely delicious, too! This is just a beautiful dessert. Oh my!!!! This is so elegant and beautiful. A piece of artwork! Heather where do you find rose petals for the tart? Your really talented and i love your blog. I'm only 12 but hopefully i can make this. I have a local organic grocery store that carries them. If you have on in your area, check there, or check at a local florist. If they don't have them readily available, they could probably order them for you. Good luck with the tart! Do you have to use low sugar jam? Hi! You can use regular jam, but the end result will be sweeter. You may prefer to serve smaller slices of tart. Thanks for asking!